The reason for checking the ESF junior events calendar since 2006 was simple – I was a mother of a teenage junior player and a junior player in the making. Right now, a teenage junior is an adult and a junior player in the making is a proper junior player. I have been watching the growing number of junior events in Europe over the years and the 2017-2018 calendar looks particularty interesting to me. In 2007 there were three junior events in Eastern Europe: the Czech Junior Open, the Slovak Junior Open, and the Hungarian Junior Open. The 2017-2018 ESF junior events calendar is displaying seven more events for juniors organised in Eastern Europe which I take as a sign of the squash growth in these countries and one in Western Europe being the Jersey Junior Open. Now, juniors can go to the Serbian JO, Polish JO (granted GP status next season), Slovenian JO, Croatian JO, Romania JO, Ukraine JO, and finally, Russian JO. The latter drew my attention immediately because it reminded me meeting Alexey Severinov (he will be representing Russia in the World Games in July) a few years ago in Bristol. He came to gain knowledge about squash and to train with Hadrian Stiff. Since our meeting, squash in Russia has grown rapidly. There is still more to do, but Russians can boast a brand new National Squash Centre in Moscow opened in 2017. As many of us are aware not every squash nation actually has such centres, and sadly Canada lost theirs this year. Therefore, my curiosity to find out ‘how they squash in Russia’ led to an interesting interview with Kirill Perov, the president of the Russian Squash Federation. Squash Mad: As a governing body the new Russian Squash Federation was recognised by the WSF in November 2016. Since then, we witnessed the opening of the National Squash Centre in Moscow and a new junior event, the Russian Junior Open, appeared in the ESF junior calendar for 2017-2018 season. It looks like a lot has been done within a short period of time. How, as a federation, did you achieve it? Kirill Perov: Thank you for this question. It wasn’t easy. We have been cross questioned by the Russian Ministry of Sport as well as by the WSF. The “National Squash Centre” is a private club. The manager of the club loves squash that is why he does a lot to develop the sport. In 2016-2017 season the club has provided courts to hold PSA 5k tournaments and Russian Nationals. In 2017 the club has provided courts to hold WSF level 1 coaching courses. The Russian Junior Open is the sole initiative of the “National Squash Centre”. Several other clubs have opened over the past few years in Moscow namely Soul Rebel, Squash People, Raketa, City Squash which provide from 2 to 7 squash courts. Squash Mad: On the Russian Squash Federation website I have found some fantastic information regarding squash development in Russia e.g. junior squash development, squash promotion among people, international links development, coaches and referees development, and setting new squash schools. What is the time line for this big project and how are you going to achieve it? I also would like you to clarify what ‘squash schools” you have in mind. Kirill Perov: To develop junior squash we have held two WSF level 1 coaching courses with an aim to coach juniors. About 30 coaches have completed them successfully. Currently, we do not have any specific development programme. Juniors from Nizhniy Novgorod coached by Mikhail Sulim and from Moscow coached by Viacheslav Perfilyev achieved some very good results. Regarding refereeing, we co-operate closely with Robert Wrobel (certified referee working with the Polish, Ukrainian, and Russian federations, residing in Poland) who has Russian roots. He gladly comes to tournaments and uses that time to deliver referee seminars to candidates who want to become referees, later, these candidates can sit a referee exam. Squash School has started as a project of Aleksandr Andreyev and Viacheslav Perfilyev who are also founders of the Russian Squash Federation. The aim was to attract school children to participate in squash sessions in local clubs (www.squash-school.ru). Zvezda club in Moscow has acquaired 20 children via this project. Squash Mad: Promoting squash means organising international tournaments. I am aware that Russia has hosted several PSA World Tour tournaments. How did these tournaments help to boost squash development in Russia? Kirill Perov: Firstly, PSA tournaments organisation means information, inviting mass media, interviews, photoreports and video clips on federal and regional TV channels. Secondly, this is an opportunity for Russian players to watch professional squash and also take part in it. This way they can compare Russian squash level to the international one. Squash Mad: At the moment, Moscow can boast 17 squash clubs which compared to London (192) do not look many, however there is a lot of potential in the city. How, as a federation, are you going to support clubs development? Kirill Perov: We want to organise the Russian Squash Tour under the Russian Federation flag with support of the Regional Federations (Regional Federations are active in their regions aiming to popularise squash, seek sponsors, etc. because they know their region better than centrallly located body), in which club teams from Moscow, St Petersburgh, Nizhniy Novgorod, Yekaterinburgh will participate. St Petersburgh, districts of Vologda, Voronezh, Nizhniy Novgorod, Sverdlov, Omsk, Lipeck, Samara, Ryazan, Rostov, Kemerovo, Novosibirsk, Sverdlovsk, Perm country, Krasnoyarsk country, the Republic of Tatarstan. The separate task for the Russian Federation right now is squash coaches training, people who not only would have practical skills but also a good theoretical base to coach beginners, to coach them how to properly play squash. Squash Mad: Squash is still trying to get in the Olympic programme and the squash community’s hopes are high for 2024 in Paris or Los Angeles. However, squash is featured in the World Games which are held in Poland. Wroclaw from 20/07 to 30/07 this year. Russia will be represented by Irina Beliaeva and Alexey Severinov. Would you please tell us more about the players? Kirill Perov: I will not be ashamed to call them great Russian squash players who have got knowledge and experience in sport. Irina is a current manager of Moscow Squash Federation. 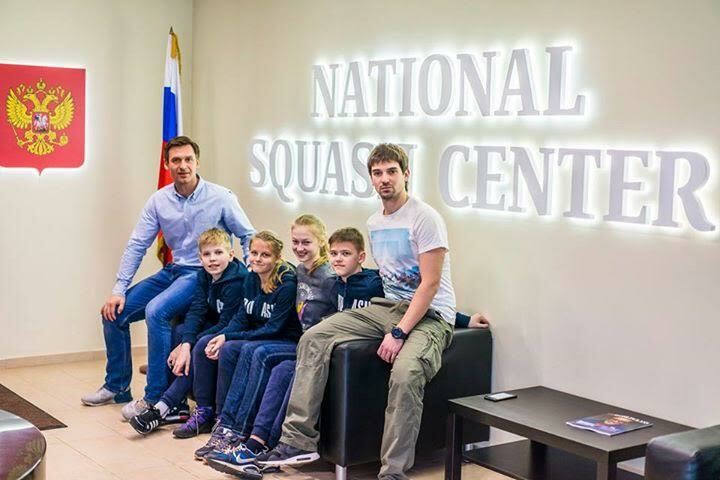 Alexey has relocated from St Petersburgh to Moscow to take a post of the head coach at the “National Squash Center” club. Irina Beliaeva (right) bears the title Master of Sport in acrobatics, and she has level 2 Russian qualification in tennis. 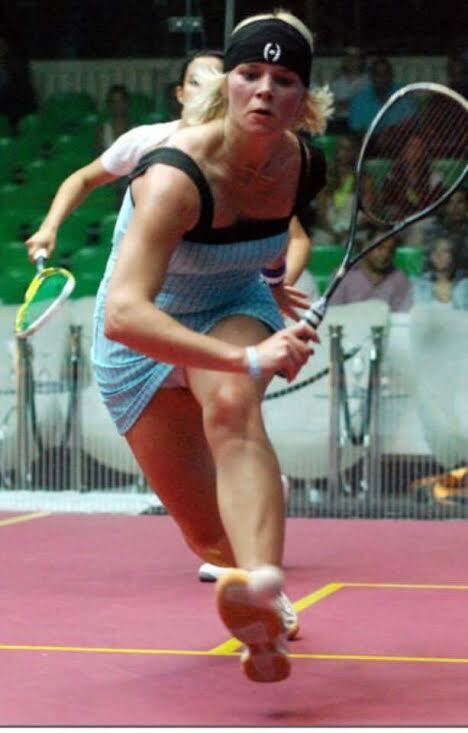 She tried squash in 2000, and in 2003, after she had her daughter, she decided to choose a professional path in it. Ranked internationally between 2007-2012. Highest ranking 70. No 1 in Russia 2003-1017. She worked as a coach from 2003 to 2017. Degree in Physical Education with PGCE in 2012. She has opened a net of clubs between 2013-1017. From 2017 Irina has started to work in the Regional Moscow Squash Federation. Sports she played 1990-2017 (professionally and as a hobby) tennis, backetball, volleyball, table tennis, billiards, golf, squash, acrobatics, swimming, karate (kyokushinkai), yoga, skiing, running. She speaks English and Arabic. She loves psychology and handicraft. Her sports credos: control your workload and recovery; count on long distance; always try something new. Her favourite quote: “We live to try”. Alexey Severinov is the first Russian professional squash player. The only coach in Russian with level 3 in coaching qualification. ASB Squash Courts partner in Russian, a true squash enthusiast. Squash Mad: If anyone wants to follow what is going in Russian Squash, can we find the Russian Squash Federation on social media like Facebook, Twitter, Instagram? Kirill Perov: Yes, you can. Rosanna is proud mother of two young squash players, a talented linguist and translator, and a popular writer on the European squash scene. Based in Bristol. Thanks for this encouraging article! It is good to know that Squash is continuing to grow on nations on all the continents. However, with 25 million players in 188 countries its allure as a participant sport was never in doubt! It is as a spectator sport that Squash is lagging. This due to its obvious inability to communicate details on/off the court. This means there will be no commercial TV, and so no economic and political clout and so a continued inability to make an entry into the Olympic movement. The solution is within reach and has been emphasized many times!